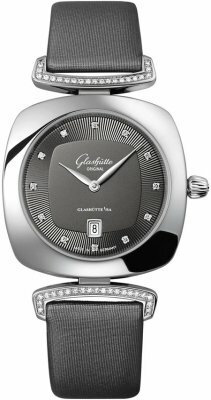 Polished stainless steel case-to-strap links - set with a total of 42 brilliant cut diamonds, weighing a total of +/- 0.14 carats. Polished stainless steel crown set with a single brilliant cut diamond weighing +/- 0.03 carats. 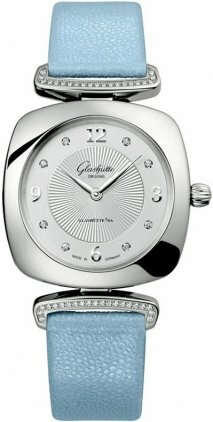 Galvanized silver dial with guilloche sunburst pattern center & flat perimeter. Combination of Applied polished Arabic Numerals & 8 diamond hour markers. 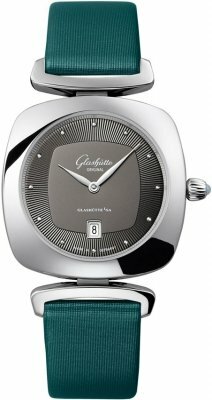 Glashutte Original Caliber 03-02, contains 8 Jewel.